GGI's Expedition towards Bhongir fort 13Feb10 - GGI-Group size: 4000+ Professionals, Increasing on day to day basis, Come & join us 2 serve Mother Nature. Three months into bicycling since last November, I have made my first century ride on the bicycle. 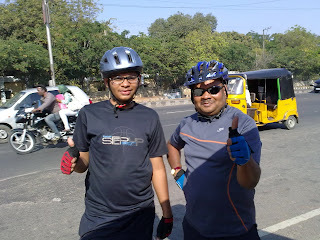 Last Saturday, the 13th of February, along with a few riders from Hyderabad Bicycle Club, my sixteen year old son, Sreemukh and I rode to Bhongir. We covered a distance of 108 kms. Being my first maiden century, it definitely feels great. And what a wonderful ride it was. Apart from the fact of covering a long distance, the other experience during the ride made it very special. I am sure my son and I will remember this ride for our lives. We started off at 4:50 AM in the morning and reached up the venue some 5 kms away. After a short wait, a group of us riders, eight to be precise, started off at 5:35 AM. And what a beginning! It felt wonderful seeing off the city so early in the morning, as Sun was waiting to shine the urban. As I started relishing the beauty of an early ride, off on the highway with literally no traffic, here comes the big disaster! Just over 20 kms probably from the city. Not too close to destination to dare a walk, and not near enough to retreat to city either! We just did a 28 km ride the previous day, to give a stretch for my son, before we take on this long ride that both of us loved to do. 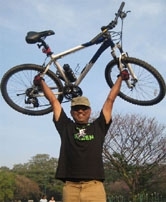 Heeding to frequent suggestions, I had been experimenting to change to lower gears (easy to pedal) as necessary to ensure that cadence (pedaling) is at least between 60 to 80 rotations per minute. This, in reality, was putting more strain on my thigh muscles than I would with a higher gear. Although I did not see a significant difference in speed between the two approaches, I did realize that this approach of lower gears actually is strengthening my thigh and calf muscles due to the imposed higher cadence. 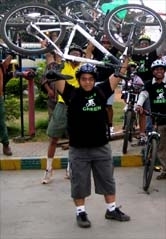 So although my legs were aching (28 km distance shouldn't have been a long one for me otherwise), I continued to experiment this during my Bhongir (Bhuvanagiri Fort) ride. I was climbing on a steep uphill and was fiddling with the gears changing to lower that wouldn't engage accurately, thanks to the low cost components on the bike. And oops! The chain got stuck between the wheel casket and the largest chain sprocket. Since I was pedaling hard due to the uphill task, the chain got stuck real hard. The organizer, Krishna and I were happily conversing on common topics and were already lagging behind the entire group, including my son, who was actually among the slowest. Krishna and I tried our level best with the limited tool kit I had to pull out the chain. Nopes, no luck! Krishna contacts other senior friends in the group and took over-the-phone suggestions, but realized it would be hard to pull off. Walking up to a nearby village and roadside bicycle repairer wouldn't help since they wouldn't have the particular needed to dismantle the sprockets. I called up my son, and asked him to return, for the next course of action had to be planned. Probably call my wife to come in car and pick us up. Knew that two cycles would never fit in 'her' car (an Opel Corsa 1.6L). As my son started retracting, I wouldn't give up, and made some more attempts to use a small hex tool as a lever with the sprocket edge as fulcrum. Inch by inch, the chain came out eventually. Ooph! Finally! More than the elation that I was able to salvage the situation, I was happy that I did not ruin the interests of my son, and Krishna who was the organizer. Good friend as he was, he had actually intimated others earlier to carry on with the trip since there was no hope of this bike getting alright. Thank you, Krishna for your moral and physical support - all I could say to myself. So we proceeded. Is there something as going back, if there was one failure? Nope. I didn't think so. And, reached Bhongir. The ride was good, except that at times I felt the group could have ridden a little slower so we could enjoy the environ as we rode rather than target to reach destination. As we reached Bhongir, I realized it was a bandh and all shops were closed. A pre-arranged restaurant allows us to get in through a back door and have an eagerly waited breakfast. We proceeded to Bhongir Fort base area and saw off the rest of the group to climb up. I had earlier decided I would not do the climb to fort top. One, I preferred to do that along with my rest of the family and two, I did not want to strain myself too much with the 500 ft climb and make the return ride a tired one waiting to make it to the destination. So here are the guys at the base. I then took off to scan the town Bhongir. Thanks to the bandh, all the shops were closed. I had a challenge to provide a second round breakfast to my son, who for sure was hungry after such a long ride of over 50 kms nonstop. I took a few pictures during my 'walk' within the town. The experiences we had in the town was amazing and unforgettable. With the helmets, gloves and my road bike, we were like aliens to this remote town. We had enough followers of children all our walk. Not just that, there were groups of adults too, who would throng to us and ask a billion questions. Here was one group, as I was taking pictures of a small temple. One guy ventured into getting onto my bike! Where we were coming from? Why were we riding such a long distance? How fast would the cycle go? What was the purpose of the gears? What was the maximum speed I achieved and how much it could go? How easy was it to control the cycle when I rode it at my maximum of 47 km/h? He was amazed that when RTC buses had been set a maximum of 40 km/h, how I could control the cycle at such high speeds. There was then another group who called themselves from Press, requested from behind us to stop as we were riding by on the main road and asked similar questions. There were umpteen number of other people who asked similar questions, all our way through to Hyderabad the entire route. There were several motorcyclists and other commuters who would slow down, ask similar questions. Boy! We are in India. We have so much interest in what is going around us and why. 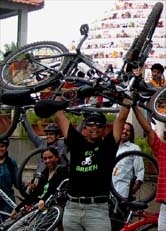 Thank you India and comfort of having a village every couple of kilometers of ride. I know I could survive in this country anytime. I am sure, need be some of these will offer some hospitality. As I rode by, slow and steady, gulping 2 liters of water each, along with my son, having a good heart-to-heart talk with him, I started wondering, if his objective was to understand India in its breadth and depth, why did the Mahatma Gandhi travel by third class passenger train and not ride by bicycle by country's breadth and depth!